Everyone who knows me knows just how much I love football. I think I literally eat sleep breathe football. My Saturdays are literally spent following Bradford City, and now all my dreams are finally coming true and I am getting to finally go see Manchester City Women. I began playing football at a very young age and went to plenty of men's games growing up. However women's games were hard to find at that time. I think in the 17 years I played I went to see one woman's game. But now thanks to the huge success World cup in 2015 women's football is seeing a huge breakthrough. A selection of women's teams even got added to the Fifa games. Unfortunately due to a knee injury the doctors have told me I won't play again however I am determined to prove them wrong and get back on that pitch. The women's game has definitely grown in popularity and here are a few players that are my biggest inspirations. Lucy is a great right back and was a stand out player in the 2015 world cup to me. 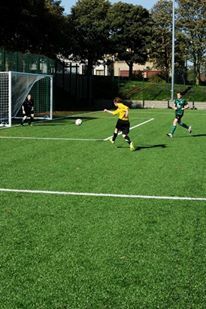 Not only is she a great defender but she also great on the attack and is a proven goal scorer. She has recently scored the winning goal in the 2016 Continental cup final. 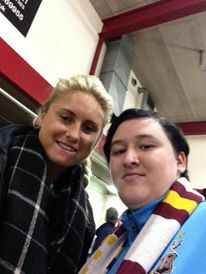 They say don't meet your idols however Lucy did a meet and greet at Bradford City earlier this year and it was amazing. She is so down to earth and is great to talk to. Lucy has also had her injury problems in the past with her knees that is why she has become one of my biggest inspirations as she has over come those injuries to carry on playing. Steph is a player I have followed for a long time. In fact it has been since her Leeds United days in 2007. Steph has been a huge influence in the women's game, she is a great leader for both club and country. From watching Steph she really holds her own in that defense, she keeps calm and really guides the team. Even my other half has said how good of a leader she is due to how she can keep the team calm and together in all sorts of different situations. Steph is another one who I have met in the past, at a Bradford City game where she was supporting her other half Stephen Darby. I didn't really get chance to speak with her for long however I am hoping to meet her again sometime. Jill is an amazing midfielder. Just like Lucy I got to know about Jill through the 2015 world cup where she really amazed me. She is such a strong player and really holds the ball. Sometimes you see taller players who struggle to use skill and are just targets for long balls. However with Jill it is a totally different story the way she gets around defenders and holds up the ball is amazing. I am hoping that if I get the all clear to play again I can try get my game like Jill's and become a stronger player. 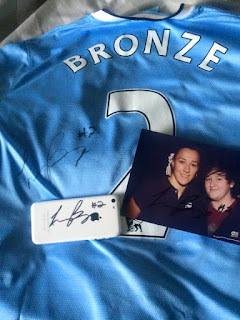 I am also hoping that one day I can meet Jill for more than an autograph and have a chat to her about her technique and maybe get some tips. So there you have it those are a few of my inspirations. I hope one day if I play again I can take aspects of each of these women's game into my matches to make me better and stronger than I was before my injury. Keep your eyes on the blog for more inspirations coming soon and maybe Jill,Steph and Lucy will be featured again on the blog. Let me know in the comments below who some of your biggest inspirations are.